Jorge Luis Borges, Argentine writer and poet, 1899-1986. The origins of tango are mainly undocumented and therefore open to subjectivity. Historians and scholars have spent years studying the historical background surrounding the birth of tango, its evolution, its music, its lyrics. It’s a big old subject and if you’re interested in finding out a bit more, then you’ve come to the right place. Watch this short, educational and fun video about how tango was born and how it spread from Buenos Aires slums to Paris before taking over the world! Well, the thing is, no one knows for sure. It’s one of life’s little mysteries! There are of course theories…. In this theory, the word tango would originate from the word ‘tangir’ and would mean ‘I play instruments’. In parts of America and in one of the many Canary Islands ‘tango’ meant ‘gathering of blacks dancing to drum music’. ‘Tango’ was also the name Africans gave to the drum itself. For slaves brought to Argentina from the Congo, the Gulf of Guinea and Southern Sudan, ‘tango’ meant ‘closed space’ or ‘a private space where permission is needed to enter’. It was also the word slave traders used to describe the place where black slaves were kept in Africa, as well as in America. 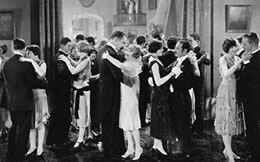 Regardless of its exact origin, in the early days of the dance, the word ‘tango’ most likely communicated ‘a closed space where people gather to dance’. …Africa, Spain, Italy, Britain, France, Poland and Russia, the world (more or less). During the later part of the 1800s and early 1900s, Argentina saw massive waves of immigrants. Most of them were single men hoping for a better life: they thought they could make enough money and then be reunited with their families. In most cases, this ended up being unachievable. Tango was born out of their need to find comfort and empathy and to express the longing for what they had left behind. This mixing of immigrants with native-born Argentines resulted in a cultural melting pot where polkas, waltz, mazurka, habanera from Cuba and candombe rhythms from Africa started to blend. Most likely, tango was born in African-Argentine dance venues and later introduced to other venues were dancing also took place: bars, dance halls and brothels. Uruguay claims to have fathered tango. We can understand why, although it seems that Uruguayan tango is simply a variation of Argentine tango (or… is it the opposite as some would argue?). However, La Cumparsita, one of the most famous and well-known tango songs was really written by Gerardo Matos Rodriguez in Montevideo in 1919. Although high society initially looked down upon tango, the younger generation in Buenos Aires eventually adopted it. By the beginning of the 20th century, tango established itself in Buenos Aires and started to spread nationally and further afield to Montevideo, the capital of Uruguay. By the early 1900s, the same generation of Argentine wealth took tango to Paris. By 1913, tango became a phenomenon there as well as in London, Berlin, New York and Finland. The elite were forced into accepting it with national pride. Tango continued to spread worldwide throughout the 1920’s and 1930’s: the dance appeared in movies and tango singers travelled the world. The 1930’s was referred as ‘the Golden Age’ in Argentina. The country became one of the richest nations in South America, the arts flourished and tango became a fundamental expression of Argentine culture. Tango being underground combined with the popularity of rock & roll sent the dance into a sleepy state in Argentina. During this period, tango was kept alive thanks to sponsorship of tours and artists by nations like Japan. It was fully brought back from its slumber in Paris in the mid 1980s, largely through the birth of the show ‘Tango Argentina’ that went on to tour the world (thank France for that!). There are so many references to tango in pop culture and so many styles of tango, from tango salón to stage tango, including some styles which don’t have a name – unfortunately (or maybe fortunately), ‘Schwarzenegger tango’ is not a recognised style. In 2009, tango was declared part of the world’s ‘intangible cultural heritage’ by UNESCO, quite fitting really because tango belongs to everyone. Sources: Please check our Credits page.